Naturally, I Googled and found an amazing number of images of this teapot, in silver as well as chintz and other china patterns. I'm still just amazed that I'd never heard of this teapot before. I'm also puzzled by its claim that it "saves at least 25 per cent of Tea." Why would that be? Any guesses? If you've seen this teapot before, or perhaps even own one, I'd love to know more! I've never seen one, but the ad is fascinating! I hope you can find one. I have never seen this either. Regarding the 25 cents savings ... I found a tea pot that was for sale and the following was written: "The teapot works by a pumping mechanism and was designed for the large Victorian family who required large teapots. 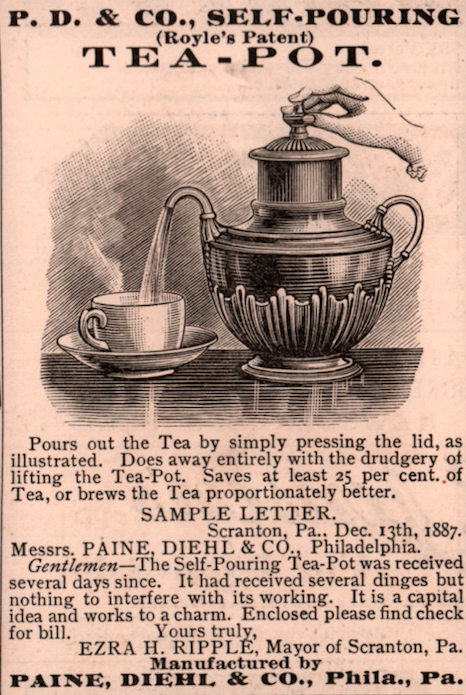 The lid is raised then depressed with the finger covering the small hole in the top of the lid, generating pressure within the teapot, hence expelling the tea through the tea and out of the spout. The curved spout meant the teapot did not have to be lifted, and the added bonus of the water being forced through the tea leaves in the bottom of the teapot, was thought to enhance the flavour of the tea." I'm thinking one could keep adding water to the tea leaves and w/the pumping, there could be more cups seeped and each cup would be "good to the last drop". No, I'd never heard of a self-pouring teapot before, either. It's very interesting! Now I will know what it is if I ever come across one somewhere.